What’s in Your Culture Cloud? Top Workplaces leaders know culture is a competitive advantage that separates them from the rest of the pack. Day in and day out, it’s a strategic priority for these award-winning organizations. But what exactly is culture? Definitions vary. People often describe it as a feeling. The personality or character of an organization. A vibe. Sure, there are plenty of ways to assess your culture. Most result in a bunch of numbers that require interpretation. But what if you could, in essence, see it? If you want people to truly understand your culture, and then work to improve it, start with a story that’s told in words and patterns. Start with a culture cloud. Since we started, we’ve collected more than 5.5 million individual words. And in the last year alone, we analyzed over 2.9 million terms from over 1 million employees at more than 6,000 organizations. 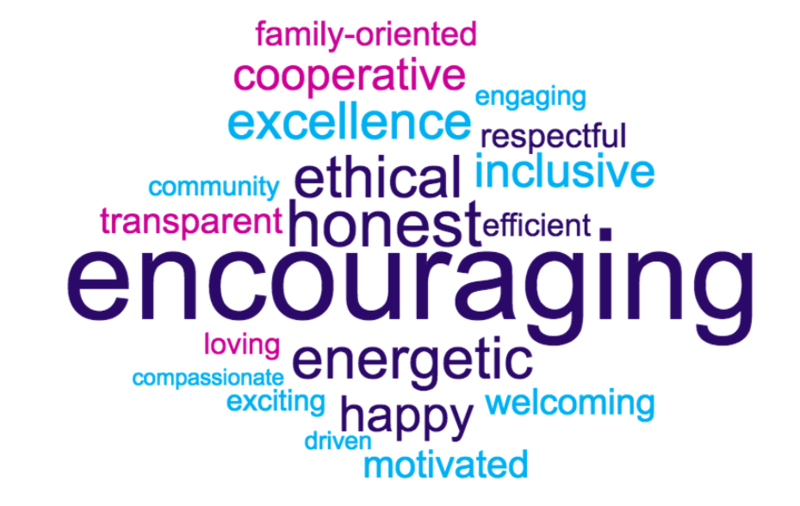 Recently, we took a deeper dive and examined the words employees at Top Workplaces organizations use to describe their cultures. What we found paints a fascinating picture — and just as intriguing are the specific words they choose. Being able to “see” your culture through a word cloud makes perfect sense. The visual representation of language — using size, placement, and color — conveys relative importance, adding meaning to any list of words used as a data set. These infographics offer both an at-a-glance view of text while highlighting important insights. The colors used in our culture clouds have specific meaning. Purple indicates words used by employees at Top Workplaces organizations of all size bands — small, medium, and large size. Words in blue show up in two of the three size bands. And finally, words in pink are unique to the specific size band of the organization. Similarly, the size of each word shows us how often the term was used to describe an organization’s culture. Larger words were said by more employees than the smaller words. But given the size of our data set, it’s important to note that smaller words are not insignificant. Those appearing in these culture clouds are among the top 20 terms. 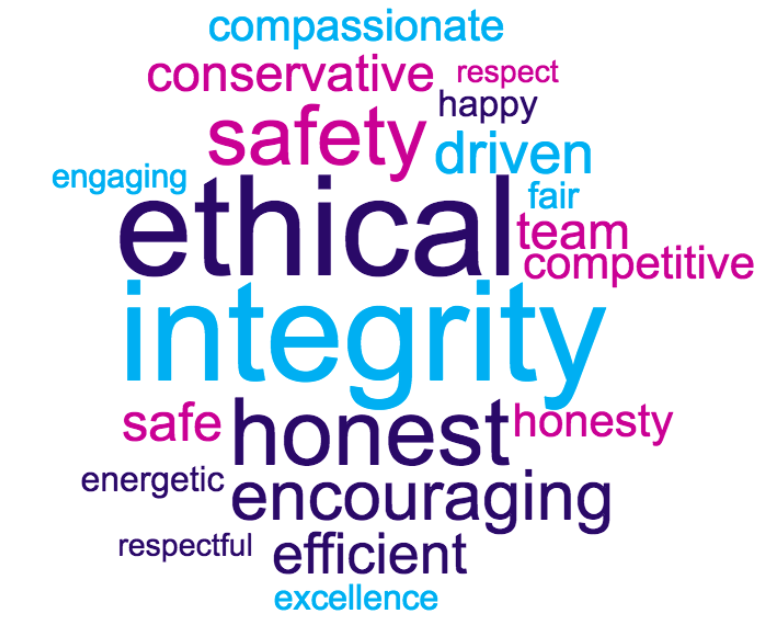 Take a walk around any workplace and you’re likely to see company values proudly displayed on a poster. Some advertise them on the company career site in an effort to attract qualified job seekers. And that’s all good — as long as these words are also reflected in your culture cloud. When your company values appear in your culture cloud, you have visual confirmation of adoption and alignment. We also see higher levels of overall engagement when an organization’s stated values are reflected in the culture cloud. In fact, organizations within the top decile of engagement scores have 40% more matching words in their clouds than the bottom decile. 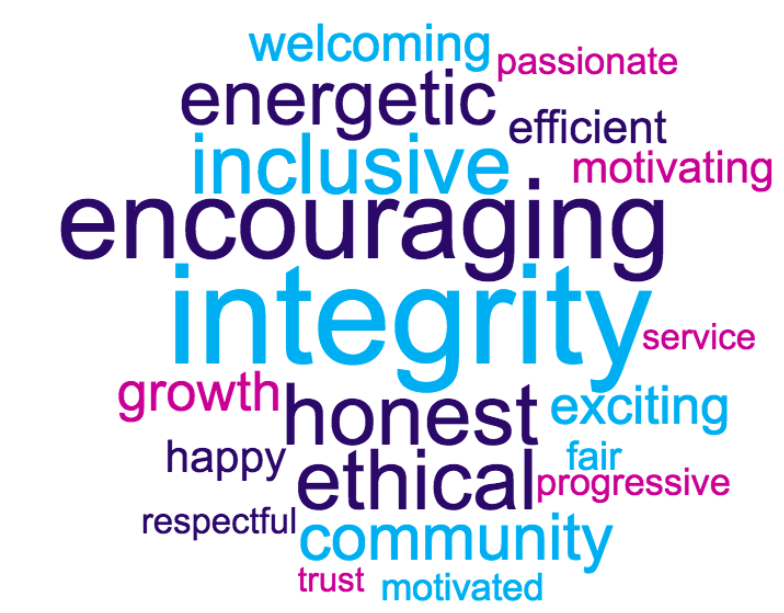 We see higher levels of overall engagement when an organization’s stated values are reflected in word clouds. There’s cause for concern when there’s a disconnect between the words you see on your values poster and your culture cloud. Our research shows that companies with low levels of alignment between company and employee values tend to have significantly lower engagement levels than companies with high alignment. There’s a lot to learn from culture clouds. They convey how employees think and feel about their organization. They reveal the day-to-day environment employees live and breathe. They reveal pain points and barriers to performance. And they tell a story that goes beyond any stated values or mission statement. There’s also a lot to learn from the culture clouds of Top Workplaces. They create a clear picture of similarities and differences. They can also be aspirational, pinpointing new or different words you may want to see in your own organization. What does your organization’s culture cloud look like? Do the words reflect the culture you want to build? Which words do you want to nurture and sustain? Which words are hindering your organization? What does your culture cloud say about your organization? If you don’t know, it’s time to find out.